In this product roundup we list the best underwater drones available on the market this year. 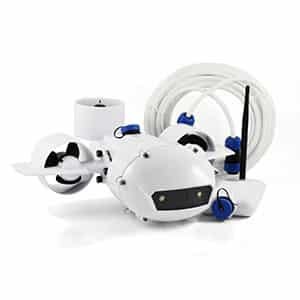 Alongside this selection, we offer insight on underwater drone applications, pros and cons, and where to find an underwater drone for sale. 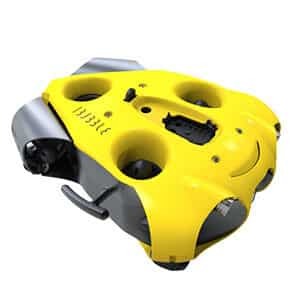 What is the best underwater drone in 2019? What is an underwater drone ? Underwater drones (or ROVs) are submersible, waterproof drones that enable users to explore marine environments remotely. These drones are able to navigate through underwater currents thanks to one or more propellers. 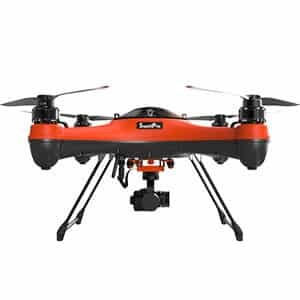 They are generally equipped with cameras, obstacle avoidance sensors, and powerful lighting to record good quality footage even in dark underwater environments. Underwater drones are a niche category of drones that is developing very quickly. These drones are commonly referred to as ROVs (remotely operated vehicles) and are mainly targeting professional users. But they are still fun to play with for hobbyists and diving enthusiasts! Underwater ROVs serve a wide variety of professional purposes, including underwater exploration, filmmaking, ship inspections, scientific research, and more. Their main purpose, however, is to capture underwater footage in seas and oceans. One important thing to keep in mind: these aquatic drones are predominantly tethered via a cable to a floating beacon or buoy at the surface. Cable tethering is necessary to get a live video feed from the drone and, more importantly, to ensure the drone doesn’t get lost in the abyss. However, some wireless underwater drones do exist (see below). Most water drones are equipped with powerful headlamps, providing visibility in dark submarine conditions. Many of them also boast 4K cameras for high-quality image capture. Other common features and add-ons include FPV goggles, robotic arms, and ballasts. Read more about drones and what to consider when buying a drone in our drone buying guide. This table represents our selection of some of the best water drones on the market. *MSRP: manufacturer's suggested retail price. These prices are subject to change over time and from one country to another (import taxes, shipping fees, etc.). Methodology/disclaimer: we haven’t tested all of the drones in this list. For more information on our methodology, read here about how we work. 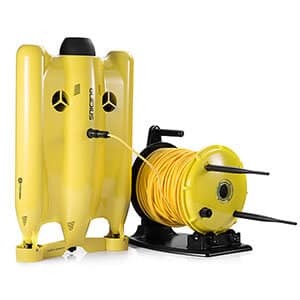 Below is more information about the best underwater ROVs selected for our list, including specs and important features. The Fathom One is a portable underwater drone with a modular design that allows users to easily remove the thrusters. Fathom’s proprietary Dive Buddy app enables the drone’s video stream to be viewed on multiple devices simultaneously. The Fathom One also includes an Action Rail for users to attach additional cameras or accessories to the drone. The Nemo offers some exceptional features for a mid-range priced drone. Its camera captures 4K UHD videos and 16 MP images. 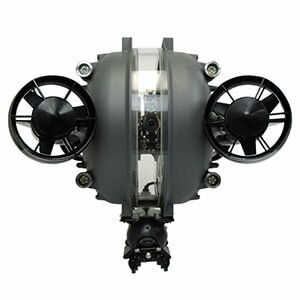 The Nemo can travel underwater with ease thanks to its QAS balance system and 4-thruster design. Users may control the Nemo via optional FPV goggles (VR headset). 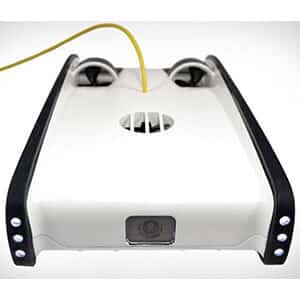 The MITO is a tethered underwater ROV that is able to reach speeds of 2 m/s. Its two 1000-lumen LED lights provide excellent visibility for the drone’s 4K camera. The drone’s waterproof communication buoy allows users to control the ROV from up to 500 meters away. The Trident’s hydrodynamic thruster design enables the drone to operate seamlessly underwater. It can reach speeds of up to 2 m/s. This open source underwater drone can operate in both freshwater and saltwater. 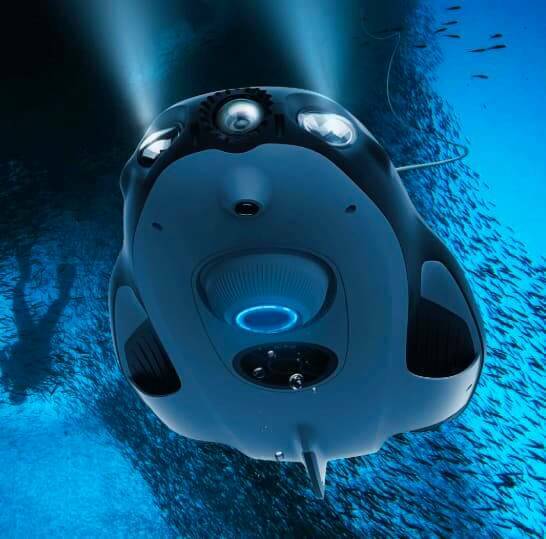 The GLADIUS is a smart submersible drone equipped with a 4K camera. 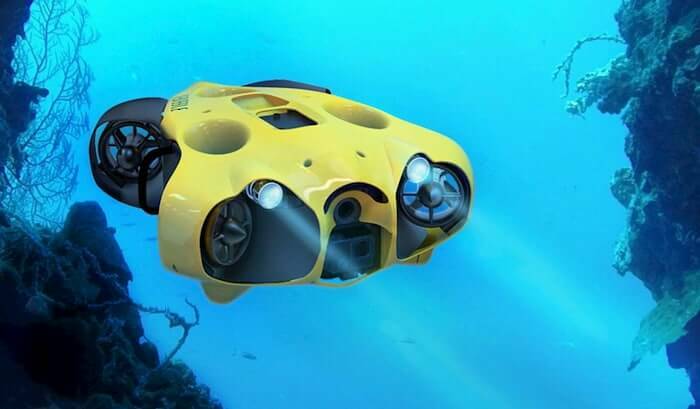 The GLADIUS underwater drone includes changeable ballasts that allows the ROV to be operable in seawater and freshwater. Its quad thrusters also allow for the drone to travel up to 2 m/s. 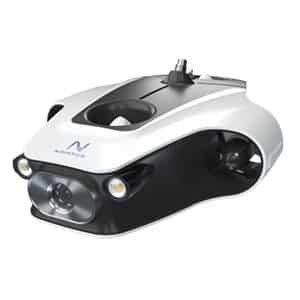 The PowerRay 4K underwater drone with camera is ideal for fishing. Indeed, a range of fishing add-ons are available. These include a bait drop and the PowerSeeker Fish Finder, which can detect fish to a depth of 80 meters. A customized version of the Zeiss VR ONE Plus VR headset is also available optionally. The Titan is a professional 4K underwater camera drone with two 1500-lumen headlamps. This underwater ROV is also equipped with six thrusters to efficiently navigate through difficult marine conditions. 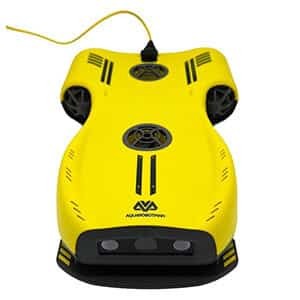 A range of accessories are available, including FPV goggles, a robotic arm, a sonar system, and a waterproof microphone. 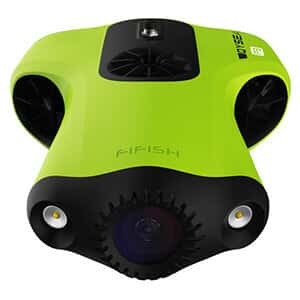 The FIFISH P3 is a professional underwater drone with an exceptional UHD camera (4K). This drone offers 1080p live video streaming and can capture 20 MP images. Moreover, it boasts a large 162° field of view and powerful 4000-lumen lighting. 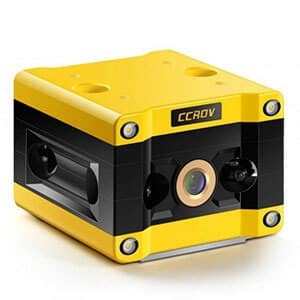 The CCROV is a compact underwater drone with camera boasting an impressive amount of 6 thrusters (4 horizontal and 2 vertical). This professional ROV has an uncommon feature : the ability for users to quickly reel in the tethered drone. The CCROV’s 4K camera can capture Ultra HD video and shoot 16 MP images. An FPV headset is also available separately. This Norwegian ROV’s high price point is explained by a sleuth of features. The PIONEER comes with FPV goggles and is operable via Wi-Fi. Its auto-depth and auto-heading modes offer an easy user experience. The PIONEER is also equipped with 3000-lumen lighting to provide underwater visibility. This affordable and autonomous underwater drone with camera (4K) and waterproof underwater controller. Hence, users can control and dive alongside their drone. The BIKI also features built-in flashlights, obstacle avoidance sensors, and an integrated GPS. 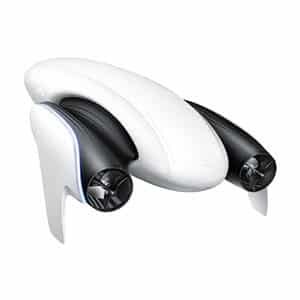 Robosea also refers to the BIKI as “bionic underwater drone”. This innovative underwater camera drone automatically follows the diver while capturing exceptional submarine footage. This level of autonomy is quite uncommon in the underwater drone niche. Notilo Plus even refers to their drone as a “personal underwater cameraman” for both professionals and consumers. 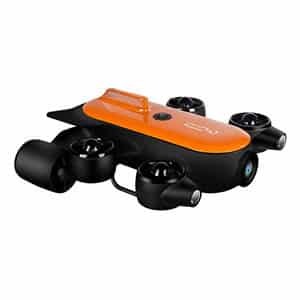 This cheap underwater drone costs only $74 and is considered a toy drone. 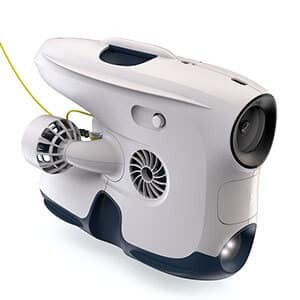 The SPYCAM AQUA is mainly intended to be used in controlled water environments such as small aquariums. However, the drone can be fitted with 4 weight balancers to be used in sea water and fresh water. A small detachable fish feeding arm can also be attached to lure fish to get close up footage of them. 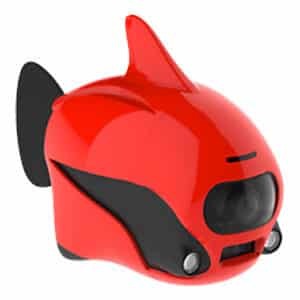 The PowerDolphin is an affordable underwater drone which is optimal for fishing. Despite its lower price tag, the drone boasts advanced features such as a 4K camera, a “Return To Home” function, and a 4.5 m/s maximum speed. In addition, a range of add-ons are available, including a bait container, a tow line, and the PowerSeeker sonar. The DEEP TREKKER DTX2 has the deepest diving depth and the longest battery life of all the underwater drones. In addition, its 4K SONY Action Cam can capture high quality images and offers a 330-degree field of view. This waterproof quadcopter is predominantly aerial, but is surface buoyant and is able to film underwater from the surface. As SwellPro puts it, this drone is metaphorically more like a “flying boat” than a submarine. The SplashDrone 3+ waterproof drone features a 3-axis gimbal 4K camera and a range of optional accessories are available. Here are the key things to consider when buying a underwater ROV to make the right decision. Most underwater ROV are tethered via a cable to a buoy. It’s important to keep this in mind, as non-experts often imagine that underwater drones work in a way similar to aerial drones, diving freely in deep waters without any restraints. To avoid losing the drone in tough and unpredictable marine conditions: the cable is essentially a leash that secures the drone in case of an engine failure, out-of-range diving, etc. To stream live video: the cable is used to transmit live video feed captured from the drone’s camera, thus allowing the operator to visualize in real time the footage captured by the drone on the remote control display (or mobile screen or FPV goggles, depending on the model). Cable lengths vary depending on the manufacturer, but they generally allow the drone to reach depths of 50 to 200 meters. Wireless underwater drones are much less common. The PowerVision PowerRay tethered water drone. The Notilo Plus iBubble submersible drone. The primary role of underwater drones is to capture images and videos in hard-to-access areas underwater. Tough marine conditions– in rivers and at sea– mean that these drones’ cameras must be of very good quality. Hence, most ROVs feature 4K cameras (UHD) with stabilization systems. 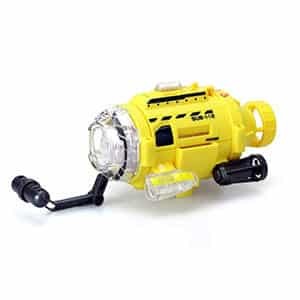 Also, these cameras need to be paired with powerful lighting (headlamps or light projectors) to help illuminate sun-restricted, murky underwater environments. A drone’s lighting power (quantity of visible light emitted) is specified in Lumen (lm). Underwater ROVs are equipped with at least two motors, thrusters, or propellers. These can be partially covered or encased by the drone’s frame for protection, unlike many aerial drones. The thrusters tend to be powerful to allow the drone to change direction in challenging underwater currents. Some advanced underwater drones also include a self-balance control system to make the drone easier to pilot. The speed of the drones in the water varies substantially. It depends on water currents, weather conditions, and the number of thrusters the drone has. On average, underwater ROVs reach speeds of 2 to 3 meters per second. There are both benefits and limitations with underwater drones. They allow users to capture exceptional underwater footage, but they are quite expensive and must generally be tethered to a buoy. How much do underwater drones/ROVs cost? Underwater drones generally cost between $1,000 and $4,000. There are cheaper drones available for less than $100, but they are toy drones. Much more expensive submarine drones exist as well (over $30,000); they are designed for industrial or military use cases. Where are underwater drones for sale? 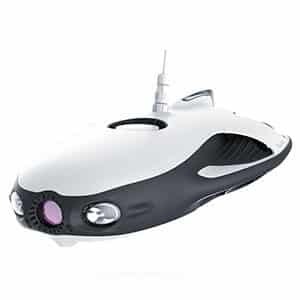 Underwater drones are for sale from online resellers such as Amazon, GearBest, AliExpress, and Banggood. These drones can also be purchased from the manufacturers directly or from some brick and mortar stores. What are underwater drones used for? Underwater drones are used for film-making, underwater exploration, port and ship inspections, environmental research, mapping, and more. What are underwater military drones? Underwater military drones are highly-advanced underwater drones that can be used in swarms for surveillance or to protect coastlines. Some can be armed with explosives. The Aquabotix SwarmDiver is a military drone, for example. Check out our selection of the best 4K video drones. Having a hard time choosing a drone? Our drone buying guide will surely help! We reference dozens of drones in our drone comparison engine.